It’s clear to almost everyone that we need to figure out some sort of alternative fuel source for widespread vehicular use before we run out of oil entirely. So far, electric seems to be the front-runner in that race, but AIRPod is a spunky little car that is introducing a new idea to the world: compressed air. 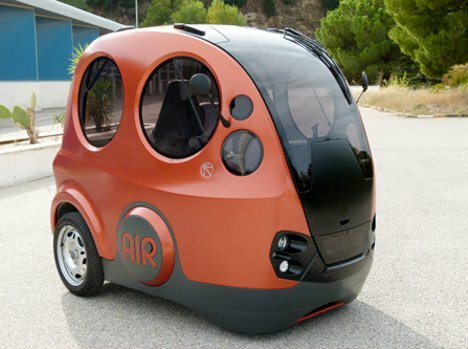 The tiny, zero-emission urban car was developed by Motor Development International after extensive research into urban mobility and alternative fuels. They came up with this adorable little bubble car that is controlled by a joystick and can even be driven inside places like train stations or airports because it’s clean-running. The flagship model of the AIRPod line can hold up to three adults and one child – definitely not a family vehicle, but perfect for commuting. Best of all, unlike those gas/electric hybrid cars on the road now, an AIRPod will only run you $10,000. You’ll have to wait to snap up your own, though – the company has been trying to get them into production since 2000, but so far they are still in the prototype stage. See more in Cars & Trucks or under Transportation. August, 2012.